Few comic concepts are as cosmic as The Green Lantern Corps. Now with the big-screen adaptation of Hal Jordan and his ring slinging comrades well into initial production stages, concept art of the eagerly awaited flick is popping up all over the place, like here, here and here. But to save you from opening an army of browser windows I've put all the best bits in one easy to find location... here. This is so cool! It looks like they are really taking this seriously. Wow. 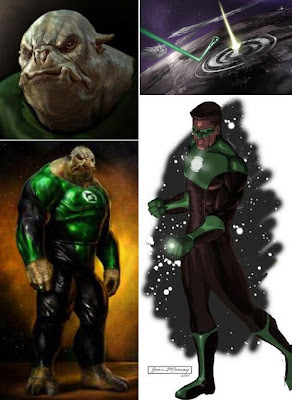 Kilowog looks realy ugly. More froggy than hippo here, but still, it captures the essence of Kilowog. I'm stoked for this thing to really happen. Warner Brothers is sitting on a merchandising (specifcally toys) goldmine with this one. Likewise guys - I think this film is going to be awesome. Done right, this truly will put GL into the same orbit as 'the Trinity'. While initially I was surprised the Hal sketch was more like Kyle's dog tag outfit, then his classic getup it's definitely got that big-screen feel. Same with the Oa Lantern been in the ground - that skyward beam of light reminds me of the imprisonment scene at the start of Superman ll. Still who knows how the final sketches ended up!! 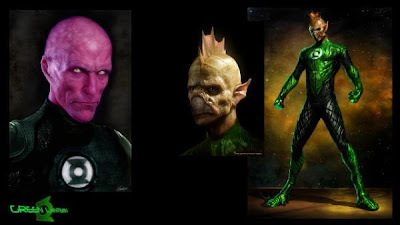 As for merchandising - yip Doug I thinK GL will be it's own 'recharging green energy' for the WB.